Back in the late '60s, a super group was bandied about that would have been bigger than the short-lived 1969 Blind Faith, the English blues band that featured Eric Clapton, Ginger Baker, Steve Winwood and Rick Grech. 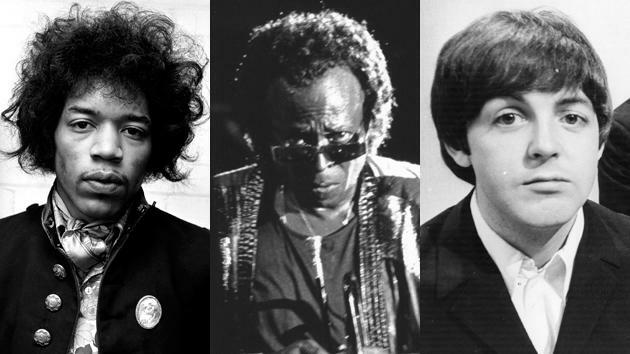 That same year, Jimi Hendrix reached out to Beatles bassist and vocalist Paul McCartney about coming to the studio to join him and trumpet legend Miles Davis and virtuoso jazz drummer Tony Williams. In a telegram Hendrix sent McCartney to the Beatles’ Apple Records building in London on October 21, Hendrix wrote, “We are recording and (sic) LP together this weekend in New York (sic). How about coming in to play bass. Stop. Call Alvan Douglas (sic) 212-5823323. Peace Jimi Hendrix Miles Davis Tony Williams." The telegram, which has been part of the Hard Rock Café collection since 1995, came to public attention with the posthumous release of Jimi Hendrix’s People Hell & Angels, which came out March 5. "It's not something you hear about a lot," Hard Rock historian Jeff Nolan said in a statement about the telegram, which is currently on display at the Hard Rock in Prague. "Major Hendrix connoisseurs are aware of it. It would have been one of the most insane super groups. These four cats certainly reinvented their instruments and the way they're perceived." There's some evidence that McCartney was unaware about the invitation when it was issued. Reportedly, Beatles assistant Peter Brown responded to the telegram the day after receiving it and told Hendrix and Davis that McCartney was on vacation and wouldn’t be back for two weeks. Unfortunately, the trio hadn't progressed far enough into the recording process for any musical evidence of the collaboration to exist. When Jimi Hendrix died, the project perished with him. The guitar hero was heavily intoxicated with sleeping pills when he aspirated on his own vomit and choked to death on September 18, 1970. “I think it would have been phenomenal," Hendrix producer Eddie Kramer told the UK paper the Telegraph. "Lord knows where it may have gone; those huge egos in the studio at the same time! I would have loved to have done that one. But it was not to be."